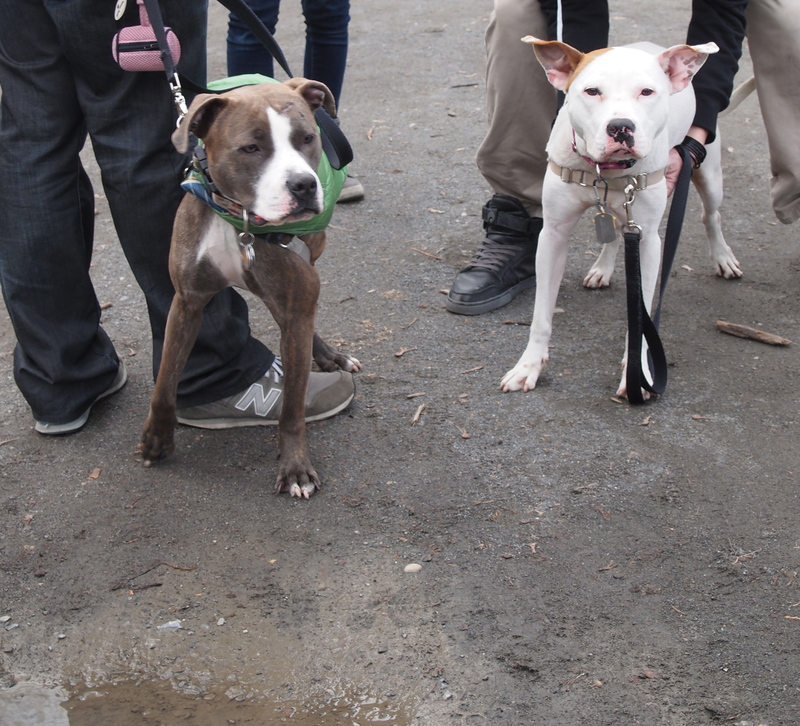 About a year ago, with the help of two other NYC pittie bloggers Two Grad Students and a Pittie and Prettie Little Pittie, we started a local pack walk called the Big Apple Pittie Pack. We created a meetup.com group, a Facebook page, did research on how other pack walks around the country operated and even had a snazzy graphic designed by our friends at Our Waldo Bungie! We organized and scheduled a few very successful pack walks, and learned something new from each one, bringing those lessons over to the next until we thought what we had was almost perfect. Then, summer 2012 hit, and it was brutal. Every weekend, the weather conditions were either unsafe for our dogs or unpleasant for the humans. Or both. Temperatures hovering around 100 degrees, sometimes higher, and terrible freak thunderstorms ruined every plan we had for a pack walk during that season. To say we were bummed is an understatement. 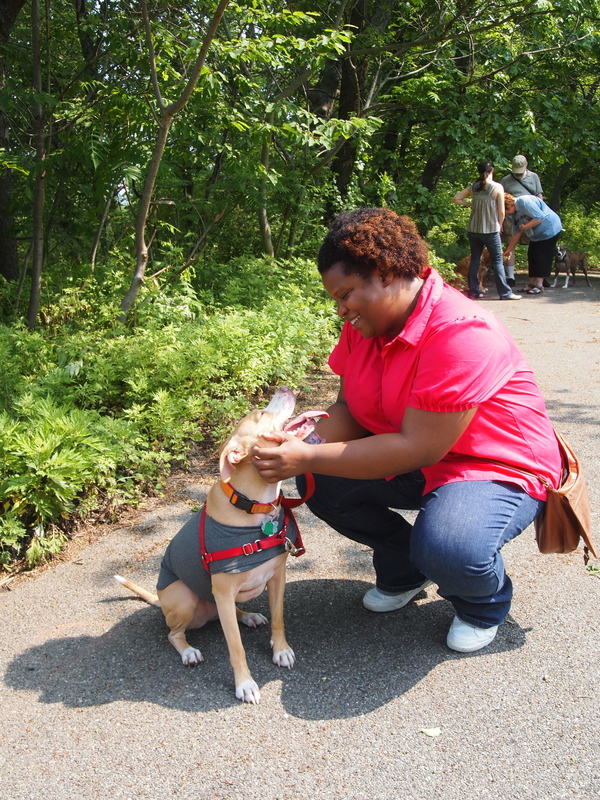 We enjoyed our pack walks, and felt like we were having an impact on the perception of pit bulls in the communities in which we walked. We liked being among a group of people who shared similar feelings about dogs and pet ownership, in general. 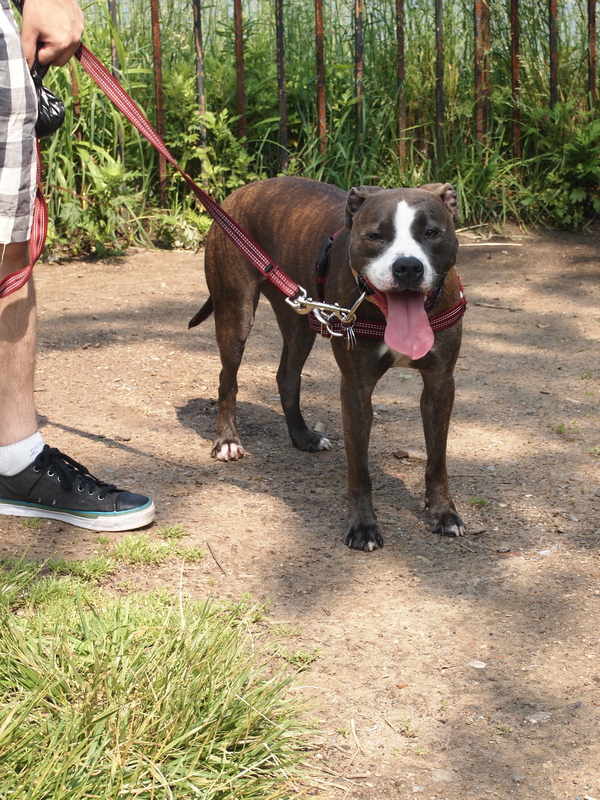 And of course, we loved meeting new people and exposing them to the wonders of a delicious, friendly, adorable pittie. But try as hard as we might, the swing of things just couldn’t get back on track and we lost all momentum. 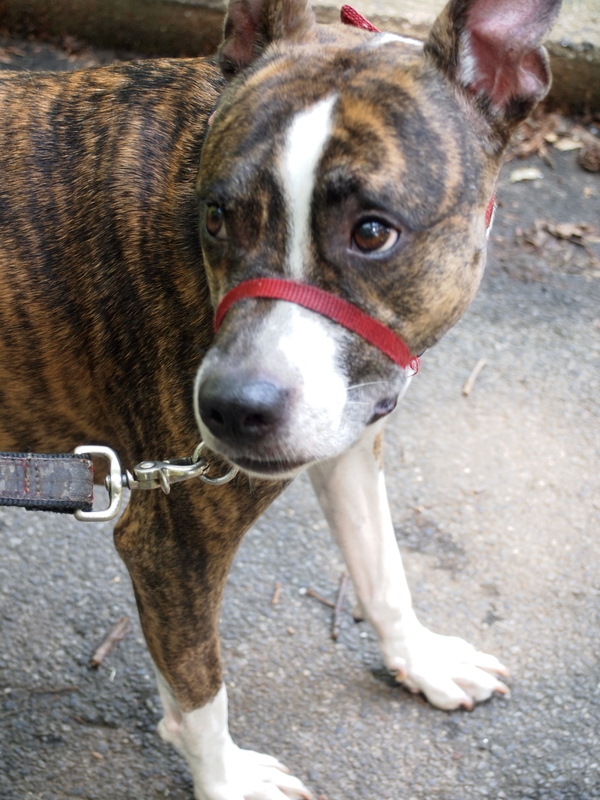 So after brainstorming a bit about how to resurrect the short-lived Big Apple Pittie Pack, we realized: why couldn’t Bully Project include the pack walks as a bi-weekly, or more likely, monthly program? The benefits would be significant for all involved. We could apply for grants to help fund the program, thusly keeping it completely free for all members, including the organizers who previously had to pay fees to meetup.com to use the service. 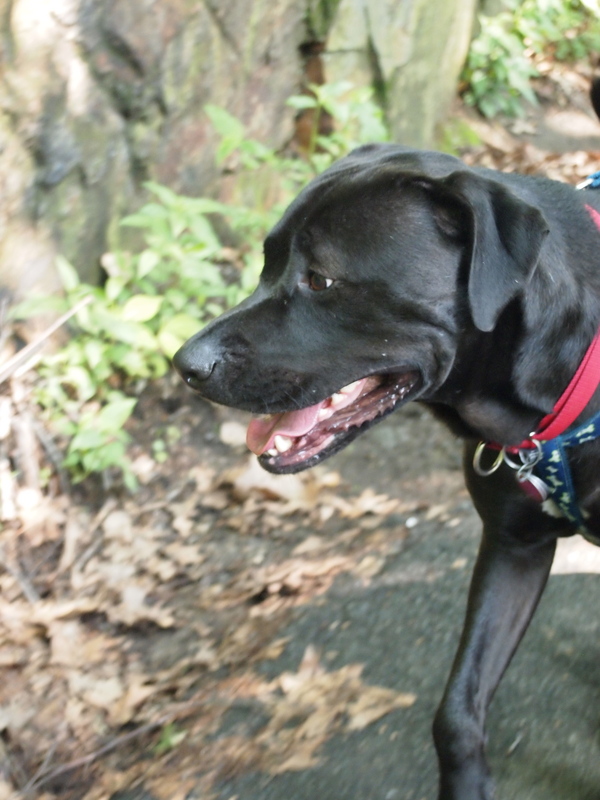 With the money raised, not only could Bully Project provide necessary resources to those members who needed it like new leashes, harnesses, collars, books, toys, etc., but we could also provide some fun stuff on each walk that was neighborhood specific. Best of all, we would be able to include the program under our insurance so that the members would have some coverage if, God forbid, something went horribly wrong. As anyone who organizes a pack walk like this knows, a lot of time, effort and energy go into the planning to ensure that everyone can enjoy the experience in a responsible, safe and pleasant manner. We were not convinced, with the new leader, that all the circumstances were being considered while planning the walks. Not only that, the continued use of the group, in a potentially irresponsible and unsafe way, could jeopardize all of the plans we were trying to put into place to make our pack walks even better than they originally were. So after trying to reason with the new organizer, through explanations and heated email discussions, and being accused of being “sketchy” and purposely ending the group, we have come to this point. And sadly, we have come to the decision that we will no longer be moving forward with the Big Apple Pittie Pack in any way. We will not be organizing any of the pack walks, we will not be participating in any of the pack walks, and we certainly will not be taking the Big Apple Pittie Pack under the wing of Bully Project. We are so sorry that the selfish and short-sighted motives of one member has led us to this decision. 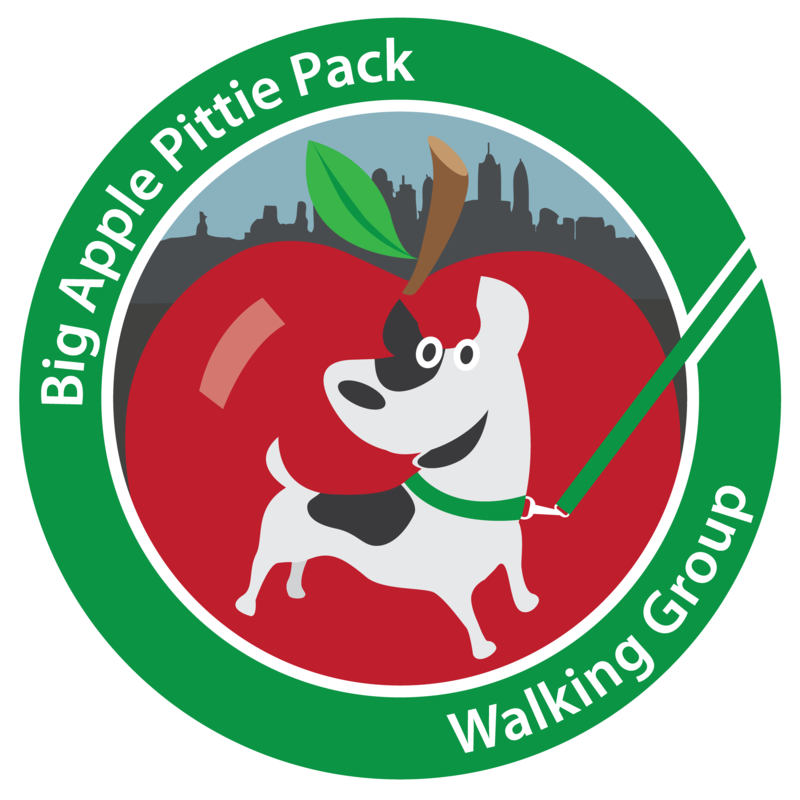 The Big Apple Pittie Pack was something we truly enjoyed, and something we truly wanted to continue and improve upon. But it is no longer enjoyable for us, and we cannot allow ourselves to be distracted from the rest of the work we are doing that we still do find enjoyable like rescue, training classes, seminars and community engagement. 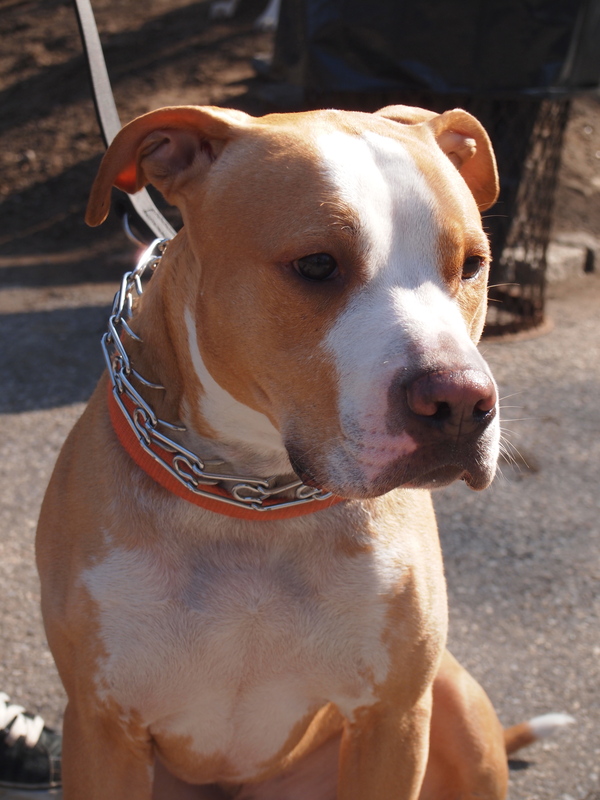 To those members of the Big Apple Pittie Pack who read our blog, we sincerely apologize to you all. Maybe there was some way we could have handled this better. Hindsight sure is 20/20. But we hope that you all stay in touch with us, and with each other. We know the pack walks will continue in some manner, though not with the thoughtfulness, responsibility and care we put into them. But apart from those pack walks, we encourage you to gather on your own. Find other members who are local to you and arrange private play dates and play groups. Go on smaller, more local group walks. Become your own advocates and organizers, and work with your dogs to have a direct impact on the people who live in your own communities. 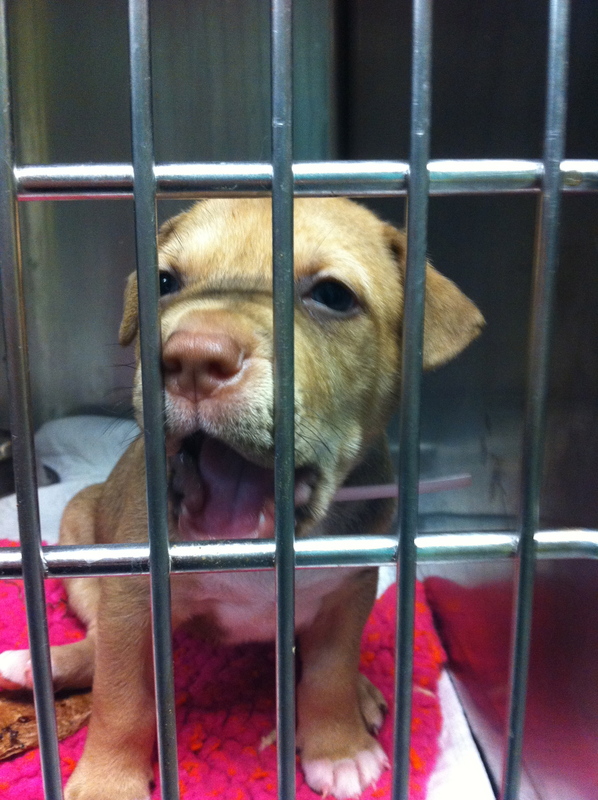 Just because our plans for the Big Apple Pittie Pack have fallen apart does not mean its message is dead. You all can still show New York City that pit bulls, and their owners, are just the same as dogs of any other breed and their owners. And more importantly, that dogs should not be judged based on their breed, but the merits of each dog as an individual. It’s Bird again and I am finally recovered from a fun weekend! Lots of chews and sleeping this week! I loved hanging with the big boys and girls on Saturday and I thought our day was over until…Mom’s friend, Erika and her scruffies randomly walked by! 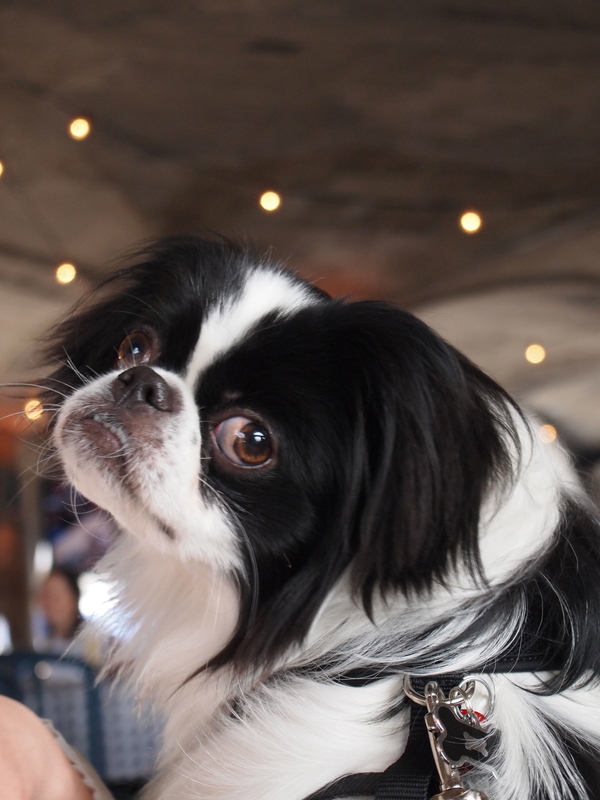 Erika is a doggie celebrity: not only is she huge supporter of animal shelters and animals in need, she is the star of a NYC reality show called “Doggie Moms”! 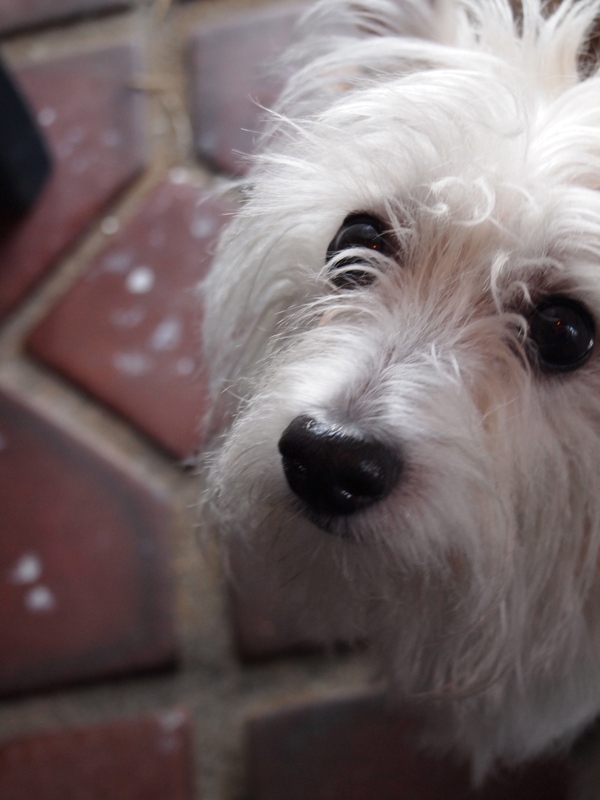 Seems like Mom has known Erika a while and even helped her adopt her Westie named Cubby. According the humans, our walks weren’t over. 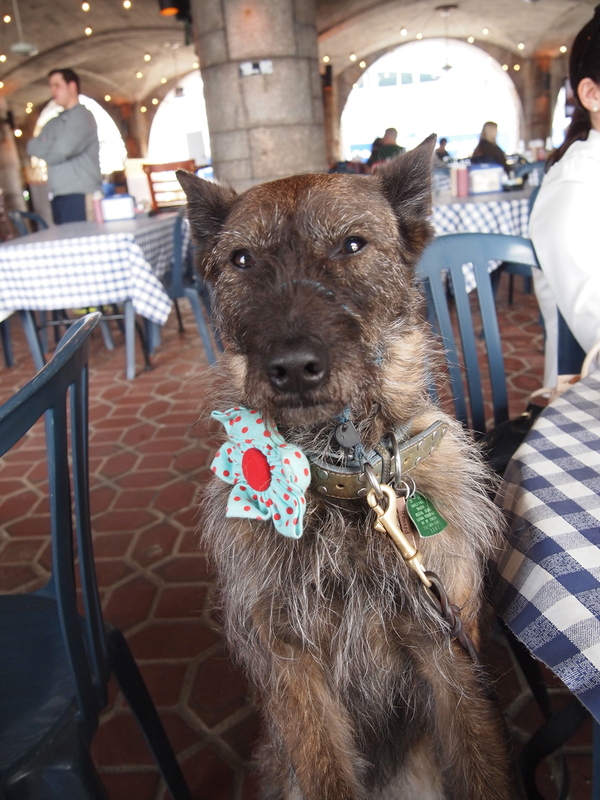 We went back uptown and met some other dogs and their humans at the Boat Basin. This time, I was the LARGEST dog! Dogs are always welcome. 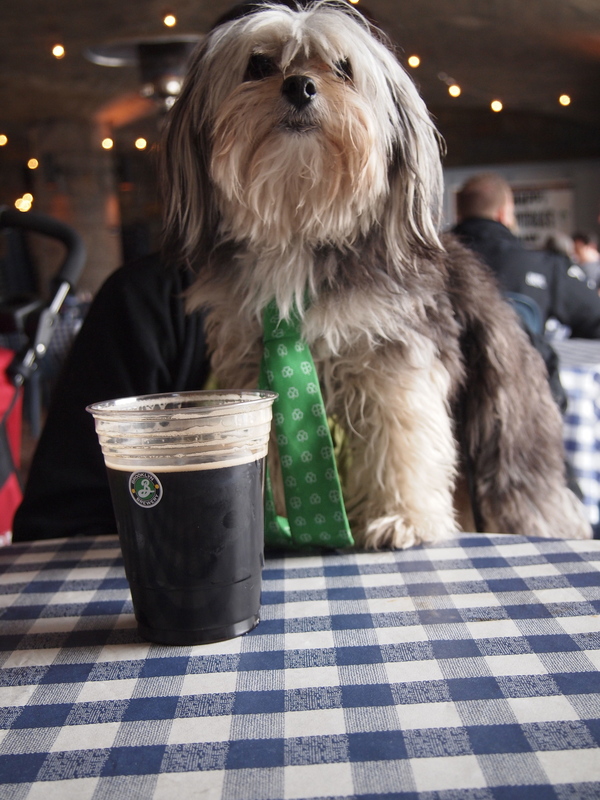 I also met a cool dude name Sig who was totally dressed for St. Patty’s Day! And, this guy, Keiko has his own wheels, too! 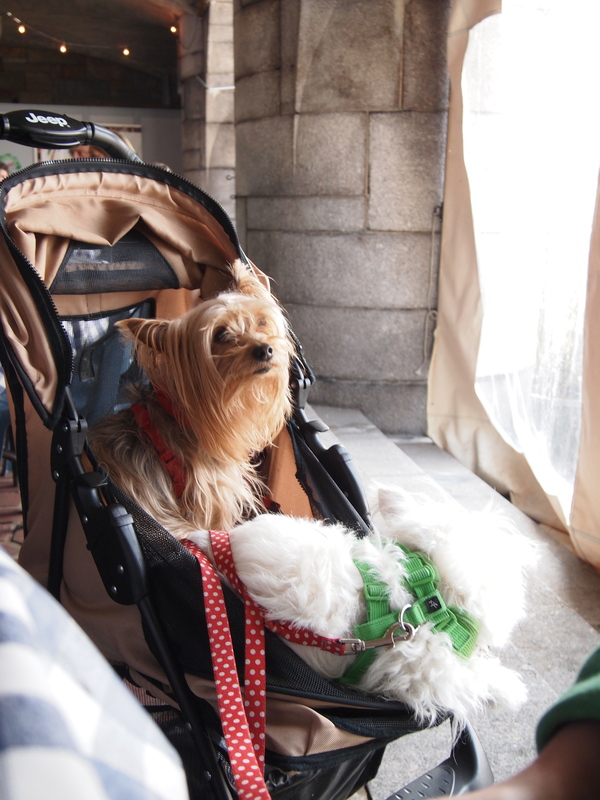 Someone mentioned I could fit into a doggie jogging stroller, but I don’t think that’s ME! A good time was had by all and we will surely do it again! Another Pittie Pack Walk! We had fun, as always! I never tell my sister, Goose, where we go or what we do because she would be jealous! I don’t think my older sister, Rosie, would care either way. Waiting for the pitties to arrive! We started out at the Riverside Park near 59th Street and walked all the way up to 86th Street. 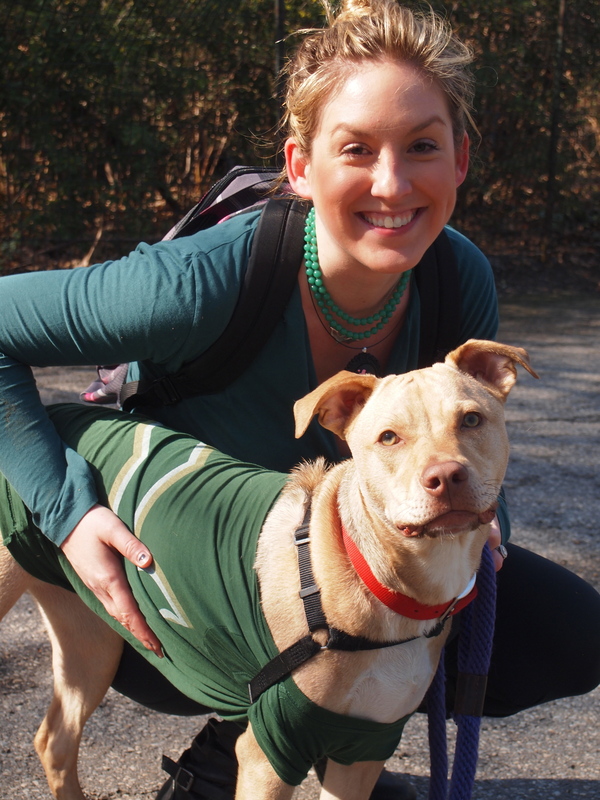 I was sad to see that Pinky’s adoption wasn’t perfect but was so excited to see her with Siobhan from the Mayor’s Alliance for New York City’s Animals. She was not only dressed in green – but looked like a dinosaur! Pinky is ready for the party! 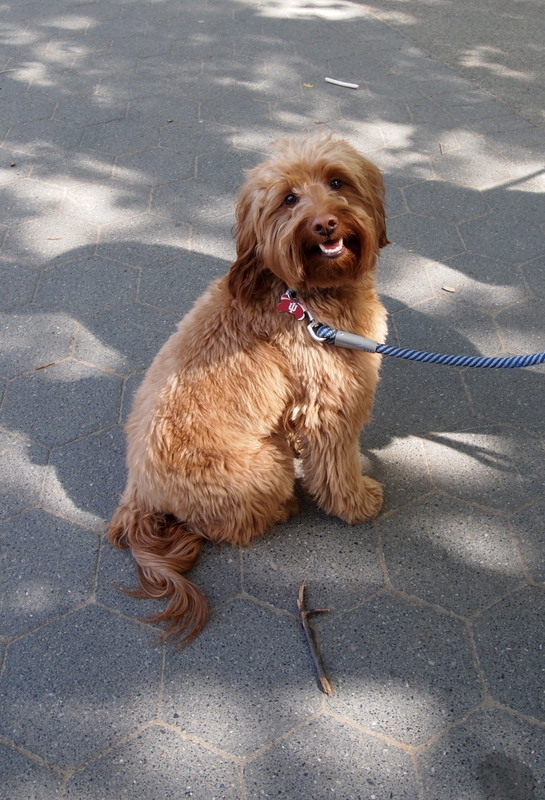 I saw some familiar faces like Remi – who is still looking for the squirrels even near the river! Havi, who likes to carry stuff, and Gertie, who has a gentle leader on like me. 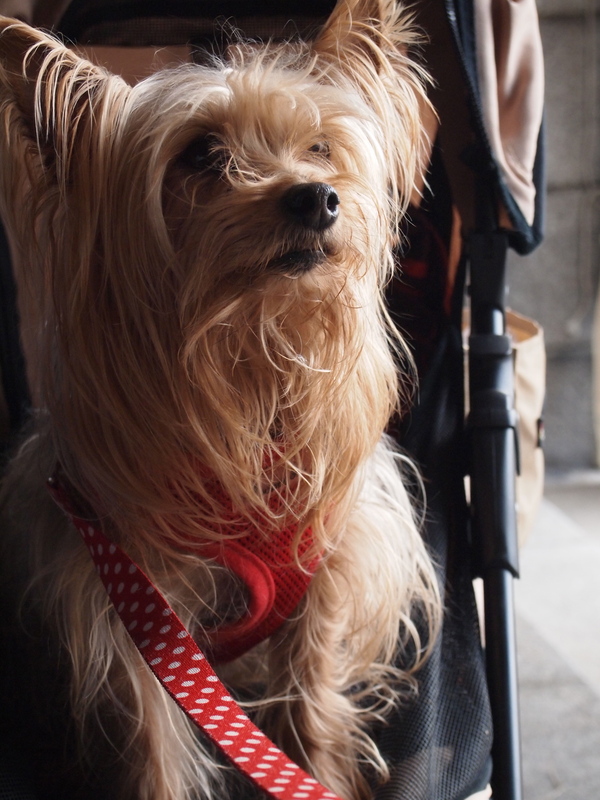 And, of course our pack favs were there, too…Emma, John and their human baby! 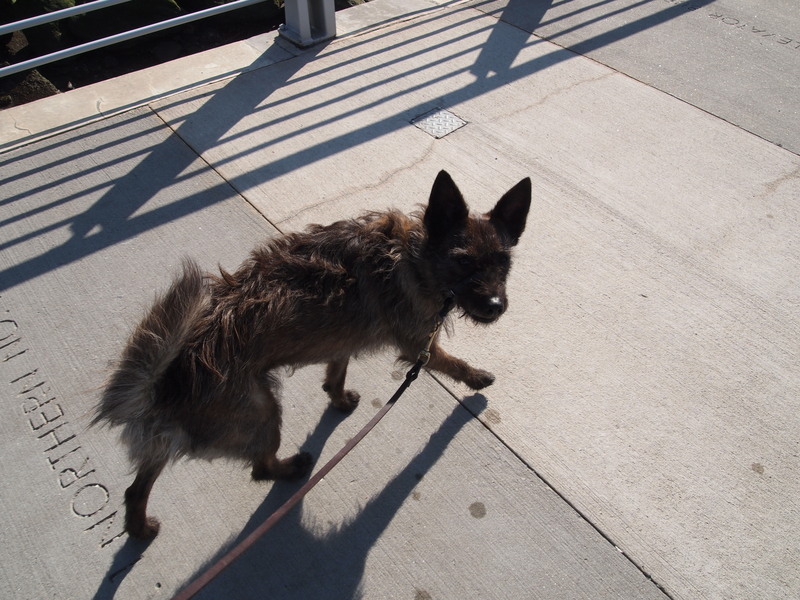 I think my favorite new pack walker was Mac, an older gent who was as sweet as can be! And, he is a very lucky dude. 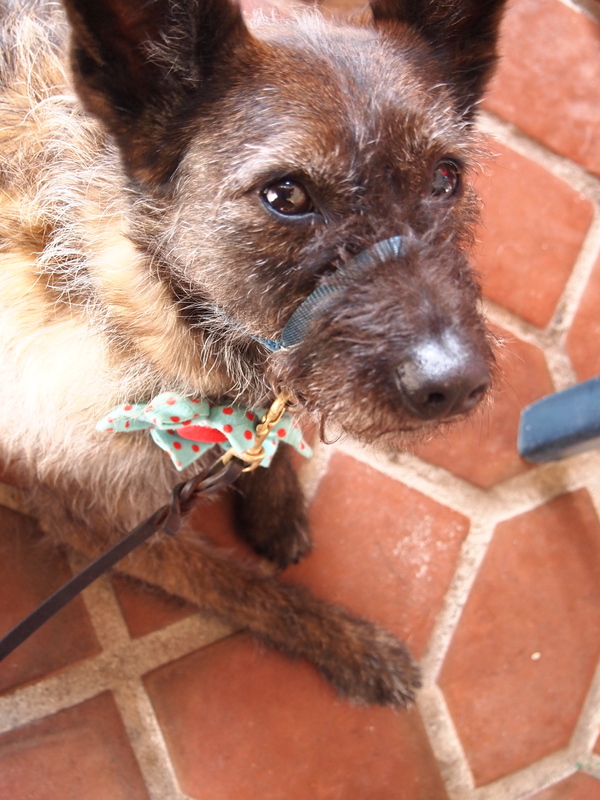 He has a rare-ish tick-borne disease and his adoptive parents happen to include a dog and cat doctor! I got to meet a great couple that not only have a great pittie named Little Bear but they have been fostering a great guy for a long time (too long of a time for me!). His name is Carlos and he needs a home of his own. Please spread the word! 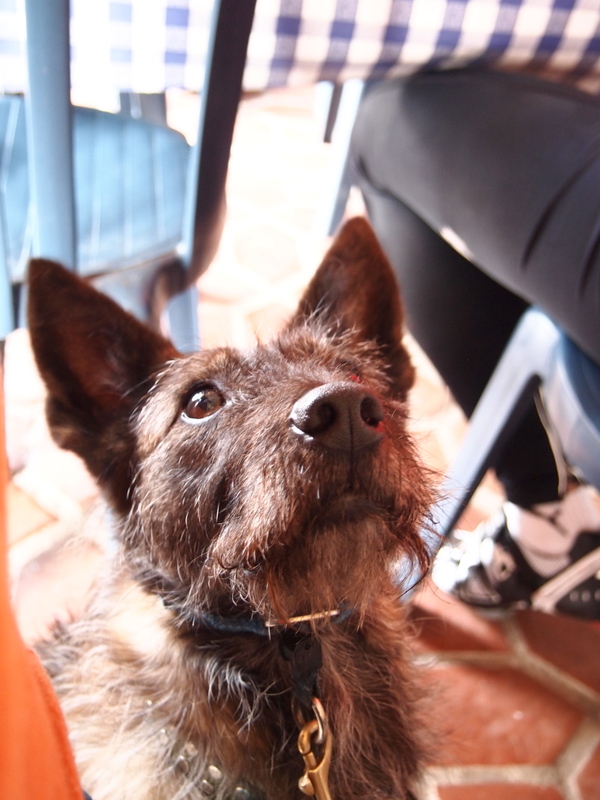 Carlos needs a forever home! Vero now with her mom! All in all, this was a fun walk. I think Mom picked up on the fact that I started to recognize people and dogs. I would make a wiggly when greeting some of the regulars. I don’t make friends easily…I need to get to know you. And, you know what, I met these people and I like them! I am going to end this post with a slide show of the walk but I have SO much more to say about the rest of the day, I will write again – part two will be posted later in the week! 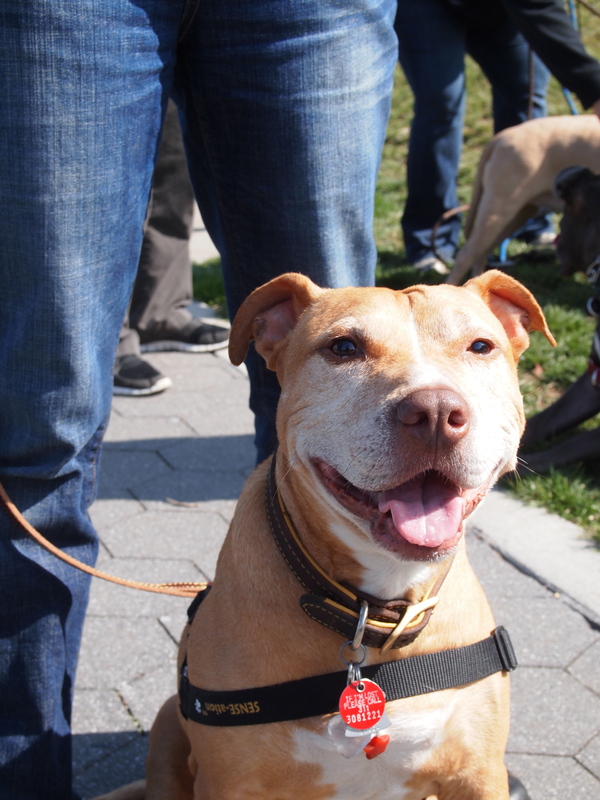 This past Sunday, we had our fifth pack walk with the Big Apple Pittie Pack! With 16 dogs, this was our largest turn out yet, and we couldn’t have been more excited. Lucy, Pinky and Bird all came along for the walk and we had dogs of all shapes and sizes, and everyone seemed to get along great. We walked along the Bridle Path in Central Park, around the reservoir, which gave us some beautiful views of both the east and west side of Manhattan, and the reservoir itself. 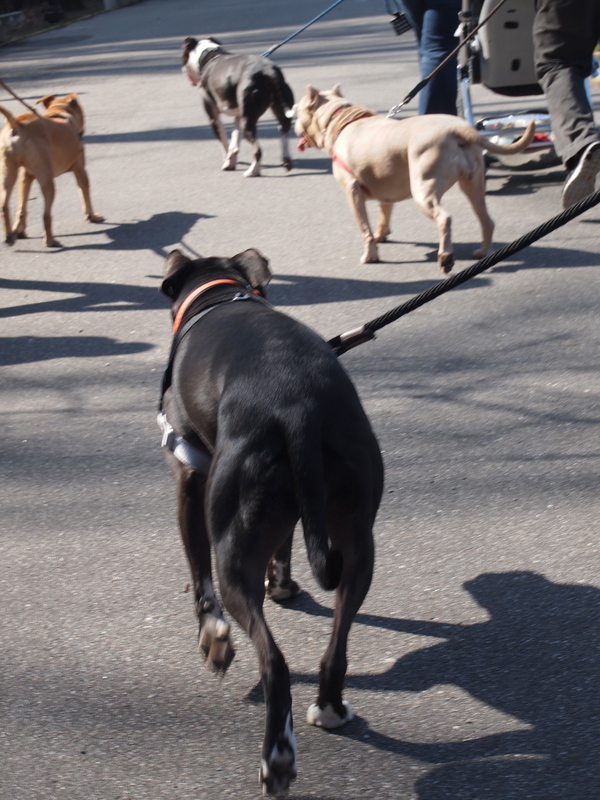 “We’re just a dog walking group,” I replied. 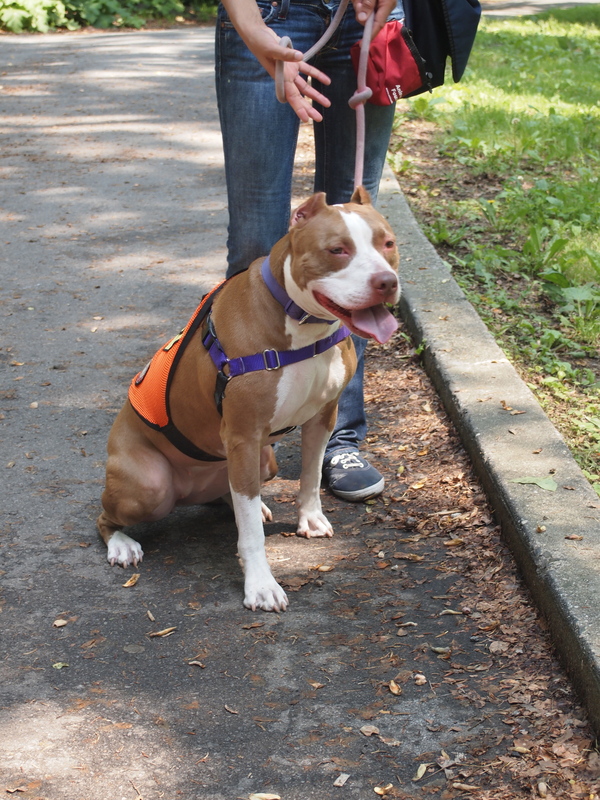 This weekend I got to check out what my mom is always chatting about – the notorious Pittie walk! 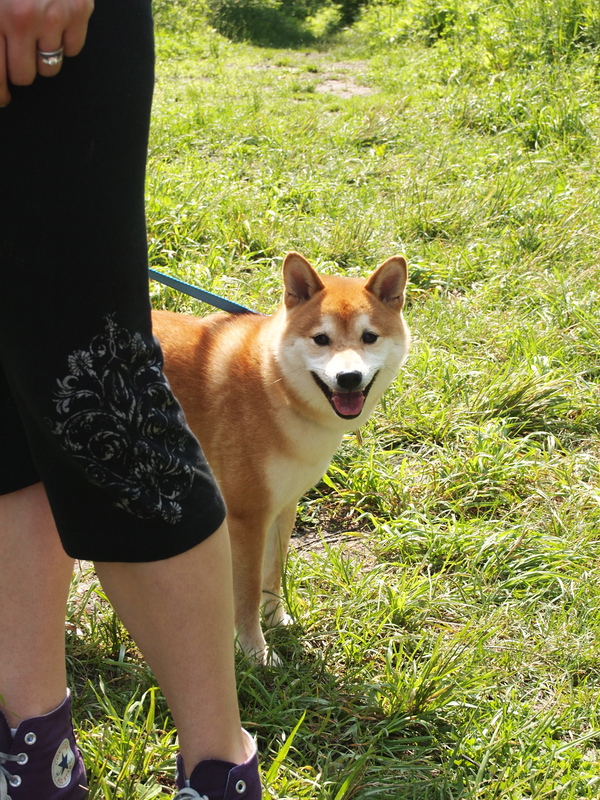 I already liked this group because they don’t exclude any breeds – as long as you can appreciate those muscle-ly, big headed dogs. Since this was my first time out, I needed a wing dog so I invited one of my besties: Alice and her mom. 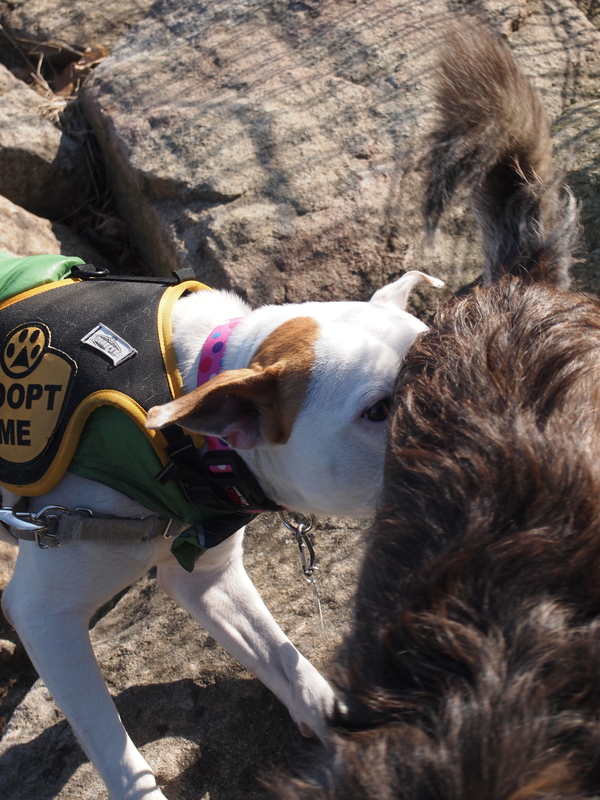 As you can see, Alice is like me – not pittie at all! 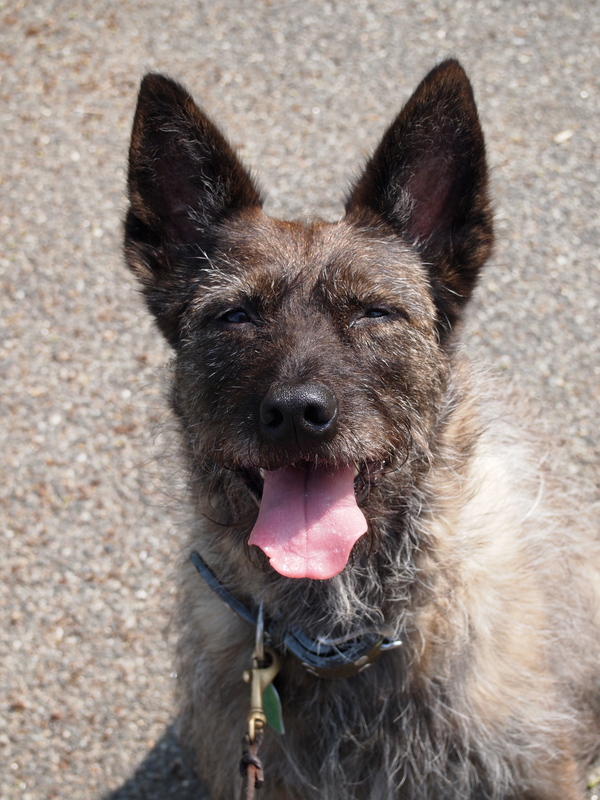 I convinced her we would have a long walk, lots of sunshine and, if we behaved, lots of treats! 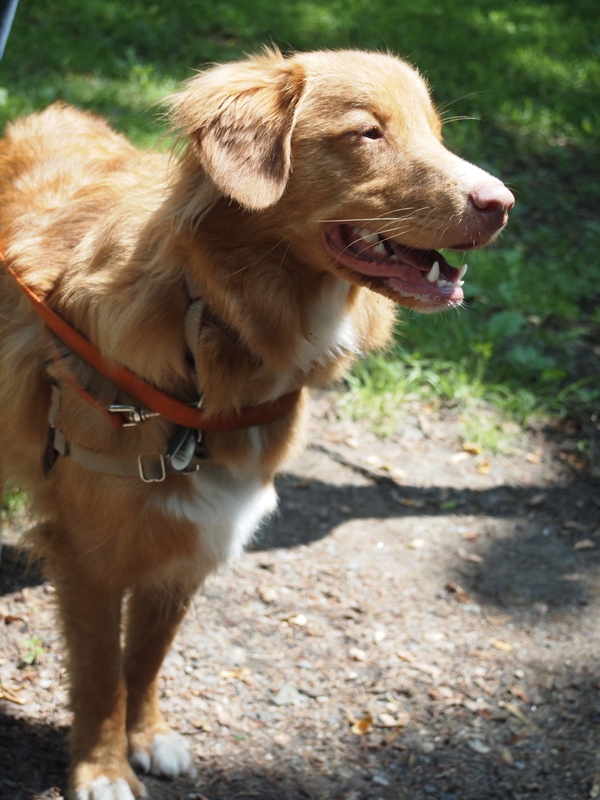 The gentle leader is my walking tool of choice – okay, not mine but my mom’s. 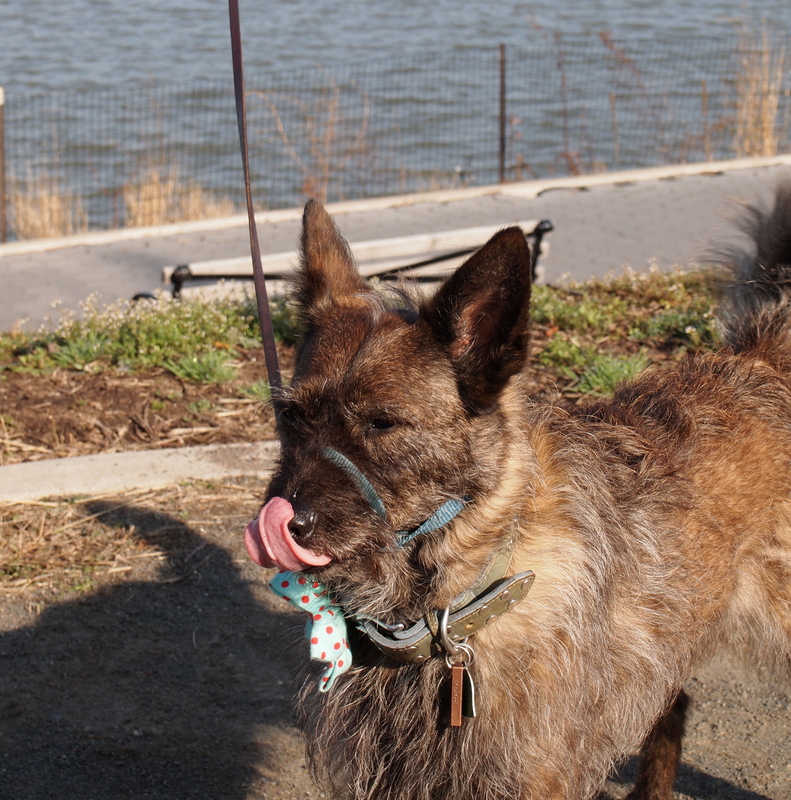 Poor Alice had to put one on because her mom assumed she would pull with all the excitement of the Riverside walk. Havi is a leader, she even wears a backpack. 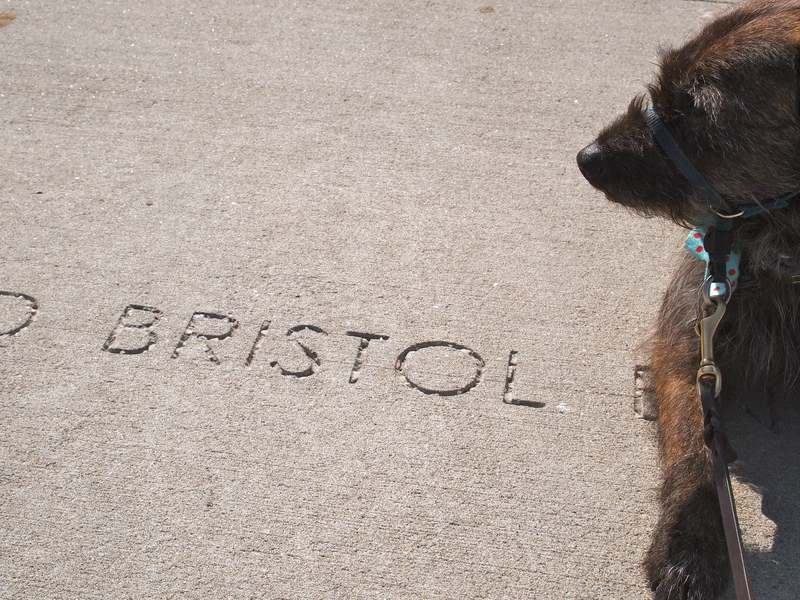 I assume she had lots of kibble in there in case we got lost! Gertie and her mom picked a sweet route to walk. Why? Paths were wide. Great for dogs like me who can occasionally react to those folks on bikes. It was beautiful. We walked RIGHT next to the Hudson River most of the walk! 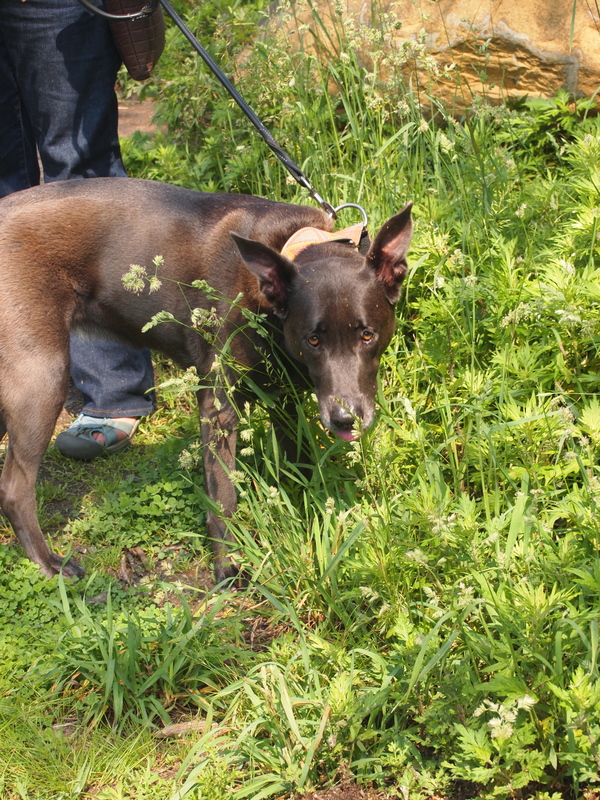 There was grass most of the time – for pee breaks, sniffing and laying down if you needed it. 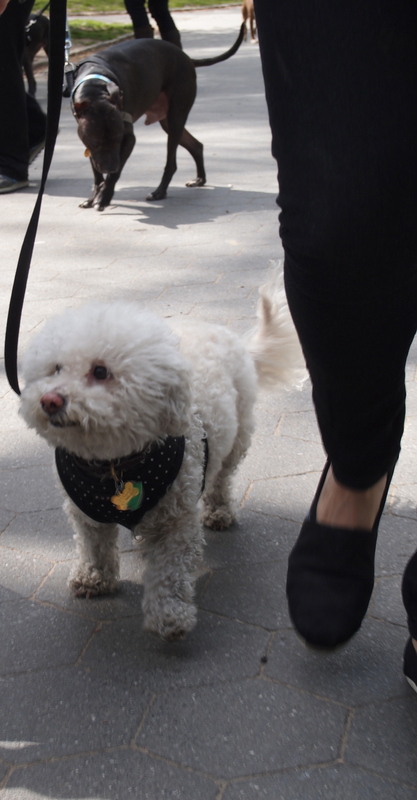 And lastly, the cutest puppy was there – Dosa! She has the pretty eyes and she looked a little nervous at first and didn’t want to walk. We were all so proud and she kept walking the entire time! I think she liked being part of a pack of grown-up dogs.